Green sea turtle resting on the shore. Hawaii. Green sea turtle swims down from the surface. Hawaii. Marine iguanas (Amblyrhynchus cristatus). Galapagos Islands. Green sea turtle feeding on algae. Hawaii. Hawksbill turtle (Eretmochelys imbricata) swims over soft corals. Papua New Guinea. Colubrine sea krait, banded sea krait or yellow-lipped sea krait (Laticauda colubrina) Lembeh, Indonesia. Green Sea Turtle at the surface. A green sea turtle: (Chelonia mydas) looks down while blocking the sun. Hawaii. Green sea turtle under sunrays in the shallows. Hawaii. Head on shot of green turtle (Chelonia mydas). Lord Howe Island. Red color variant of Galapagos marine iguana (Amblyrhynchus cristatus). Galapagos Islands. Marine iguana (Amblyrhynchus cristatus). Galapagos Islands. Head on shot of hawksbill turtle in Indonesia. A green turtle (Chelonia mydas) swims by in the blue water. Hawaii. Greensea turtle takes a breath at the surface. Hawaii. Green sea turtle swims down under a breaking wave. Hawaii. Green sea turtle. Hawaii. Hawaii. Banded sea krait (Laticauda colubrina) on the surface from below. Indonesia. 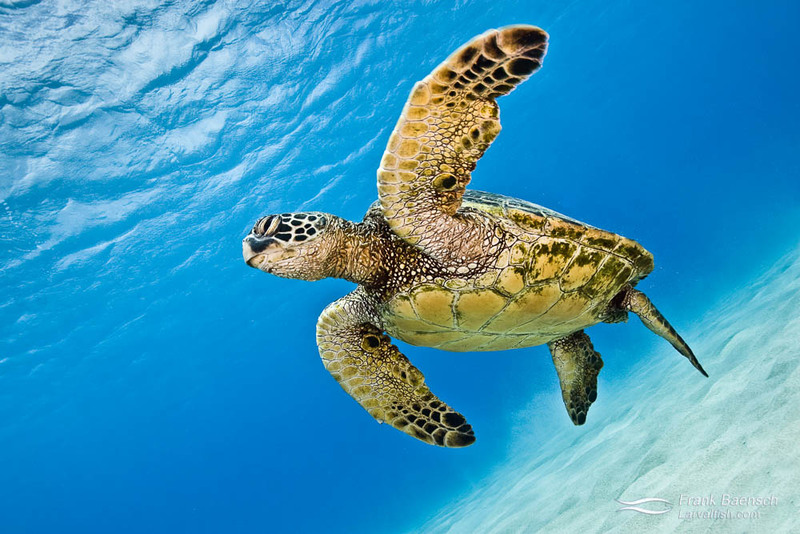 Green sea turtle - Icon of the sea. Hawaii. Yellow tang and brown tang clean a green sea turtle (Chelonia mydas) off the Big Island, Hawaii. A green turtle (Chelonia mydas) feeds on turtle grass (Thalassia testudinum) in a bay off Lod Howe Island. Banded sea krait (Laticauda colubrina) curls up in typical snake-like fashion on a reef in Raja Ampat, Indonesia. A loggerhead turtle (Carreta carreta) sleeping in a cave. Bahamas. Green turtle (Chelonia mydas) circling in the turquoise waters of Hawaii. Over 90% of the Hawaiin Green Sea Turtle’s nesting activity occurs at French Frigate Shoals in the Papahānaumokuākea Marine National Monument (Northwest Hawaiian Islands). Hawaii. A green turtle (Chelonia mydas) swims above sand while dispalying its paddle-like flippers. Hawaii. Banded sea krait (Laticauda colubrina) in Raja Ampat, Indonesia. Head shot of a green sea turtle (Chelonia mydas). Hawaii. Face to face with a green sea turtle (Chelonia mydas) on the surface. Hawaii. Tangs and a parrotfish remove algae growing on a green sea turtle (Chelonia mydas). Hawaii. A green sea turtle (Chelonia mydas) on a shallow reef. Hawaii. Green sea turtle (Chelonia mydas) displaying its powerful flipper. Hawaii. A green sea turtle (Chelonia mydas) up close in Hawaii. Colubrine sea krait, banded sea krait or yellow-lipped sea krait (Laticauda colubrina) in Lembeh, Indonesia. Green sea turtle stares at the camera. Hawaii. The rare sight of a leatherback turtle (Dermochelys coriace) feeding on thimble jellyfish. Solomon Islands. Banded sea krait (Laticauda colubrina) hunting over a bright red sponge on a reef in Raja Ampat, Indonesia. Green turtle (Chelonia mydas) feeding on algae in shallow waters. Hawaii. Head shot of green sea turtle. Hawaii. Green sea turtle swims out of a cave. Hawaii. Green sea turtle (Chelonia mydas) perks up on shallow, rocky bottom after feeding on algae. Hawaii. Yellow lipped sea snake (Laticauda colubrine) on a gorgonian. Fiji. A green sea turtle (Chelonia mydas) feeding on algae cover rocks. Hawaii. Head on shot of green sea turtle (Chelonia mydas) on a shallow reef. Hawaii. Green sea turtle (Chelonia mydas) resting inside a cave. Hawaii. Green sea turtle on the surface. Hawaii.